"In most places in Antarctica, we can't explain the ice-shelf thinning through melting of snow at the surface," said Hamish Pritchard of the British Antarctic Survey. "So it has to be driven by warm ocean currents melting them from below." 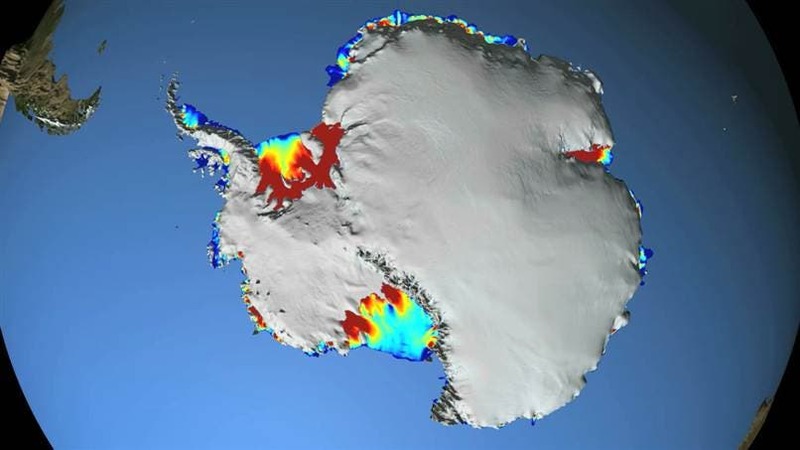 Pritchard's team used the laser altimeter on Nasa's Icesat spacecraft to map the changing thickness in 54 ice shelves around Antarctica, incorporating some 4.5 million data points between 2003 and 2008. Twenty of the shelves were assessed to be being melted from below by warm ocean currents. Most of the 20 are in West Antarctica, and show thinning up to seven meters per year. Some of the greatest melting has been seen where deep troughs cut across the continental shelf, allowing the water easier access to the shelves' undersides. "What we realize now is that we're looking at a very sensitive system," Dr Hamish Pritchard, from the British Antarctic Survey (BAS), told BBC News. "Previously, you would have thought that we needed a lot of warming in the atmosphere to get a substantial loss of ice from Antarctica – because it's such a cold place. But what we show is that that's not necessary; you don't need radical change. "All you need are quite subtle changes – such as a change in the winds – and that can produce effects at the edges of Antarctica that then lead to a loss of a lot of ice." 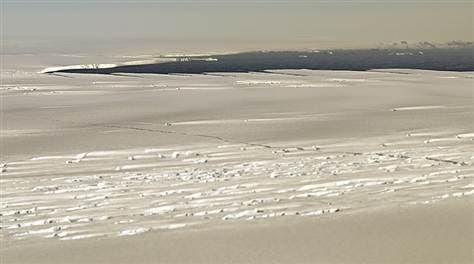 NASA researchers flew over the Pine Island Glacier Ice Shelf on Oct. 14, 2011, as part of the agency's Operation IceBridge. A large, long-running crack was plainly visible across the ice shelf. Experts believe that piece of the shelf could break off soon. The team's results represent the culmination of a massive international ffort to observe the loss of Antarctic ice using NASA's ICESat satellite. Tthe researchers closely monitored how the thickness of West and East Antarctica's ice changed over time. In some cases, Pritchard said, shelves thinned by as much as several meters each year. And the pattern of that melting, he added, suggested that at least 20 out of 54 observed platforms of ice across the continent were being melted largely by the oceans below. While the exact factors driving the warming of Antarctic waters aren't known, scientists suggest that past warming conditions in the tropics have created strong winds to the south in Antarctica, fueling ocean currents that bring hot water to the surface. "In all the cases where ice shelves are being melted by the ocean, the inland glaciers are speeding up," Pritchard said in a statement. "It's this glacier acceleration that's responsible for most of the increase in ice loss from the continent and this is contributing to sea-level rise." On the Antarctic Peninsula, the spit of ice just south of Argentina, warm winds seem to be melting ice shelves from above, skimming layers of snow from the top. "Strong westerlies go up over the chain of the peninsula mountains and these winds descend, they warm up, melting the surface of the shelves on the eastern side. So, although we have two different melting mechanisms, the ultimate cause is the same – it's the wind," said Dr Pritchard.